Following this plan, immediately after Voltaire’s death, on the night of the 30th/31st May, his body was hurriedly embalmed. Heartless and brainless though it was, the corpse was dressed in gown and nightcap, and strapped upright into Voltaire's distinctive star-spangled carriage. At 11.45pm on the 31st it set off into the dark with only a servant in attendance, closely followed by a second coach containing Dompierre d’Hornoy and two male cousins. 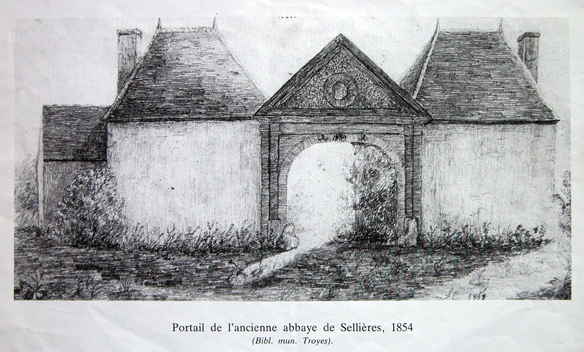 The abbé Mignot had long since abandoned any idea of travelling to Ferney and and settled on a much closer destination, the Cistercian monastery at Sellieres in Champagne, where he was nominally abbot. Fully equipped with certificates from the abbé Gaulter and M du Tertre, Mignot went on ahead to prevail upon the (reluctant) local prior Dom Potherat de Corbierres to permit Voltaire's burial. The coach bearing Voltaire arrived in late afternoon. The funeral which followed was a bizarre mixture of the makeshift and the splendid. The body was placed in a plain deal coffin (still apparently in existence) and, accompanied by Mignot in full ecclesiastical rigout, set in the chancel of the chapel surrounded by candles. Dom Meusnier, the only other permanent resident of the semi-derelict abbey kept an overnight vigil with some lay assistants. The following day a requiem mass was celebrated, attended by various local ecclesiastics and a congregation of sixty somewhat unenthusiastic parishioners. The great philosophe was then laid to rest to the sound of marsh frogs in a hole expeditiously dug in the centre of the chapel floor. 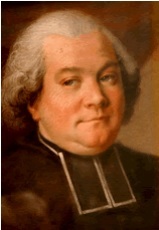 Poor Dom Potherat was left to face the music from the bishop of Troyes, though thoughtfully provided with letter of defence stating that Voltaire was not officially excommunicated. Mignot, leaving nothing to chance, published all the relevant letters in Grimm's Correspondance littéraire. There was much rumination and recrimination, but on the whole it seemed best to do nothing; Voltaire's burial was (at least temporarily) a fait accompli. Roger Pearson, Voltaire Almighty (2005), p.387-390.